UFO-Forschung - WDR-5 Radio-Beitrag und Podcast am 30.12.2014: UFOs - Faszination am Himmel Außergewöhnlich oder außerirdisch? The thin air of Mars requires a stronger updraft to form dust devils than is needed to create a similar vortex on Earth, according to new research. Dust devils usually form when the Sun heats the ground and the air above it, causing the heated air to rise rapidly and the column of air then starts to rotate. "To start a dust devil on Mars you need convection, a strong updraft," said Bryce Williams, an atmospheric science graduate student at the University of Alabama (UAH). "We looked at the ratio between convection and surface turbulence to find the sweet spot where there is enough updraft to overcome the low level wind and turbulence. And on Mars, where we think the process that creates a vortex is more easily disrupted by frictional dissipation—turbulence and wind at the surface—you need twice as much convective updraft as you do on Earth." Williams and UAH's Dr Udaysankar Nair combined data from a study of Australian dust devils with meteorological observations collected during the Viking Lander mission in 1976 and a one-dimensional Mars planetary boundary layer model to find the ratio between convection and surface friction velocities conducive to forming dust devils. Dust devils on Mars can grow to the size of terrestrial tornados, with a funnel more than 100 metres wide stretching as much as 12 miles (20 km) above the Martian surface. 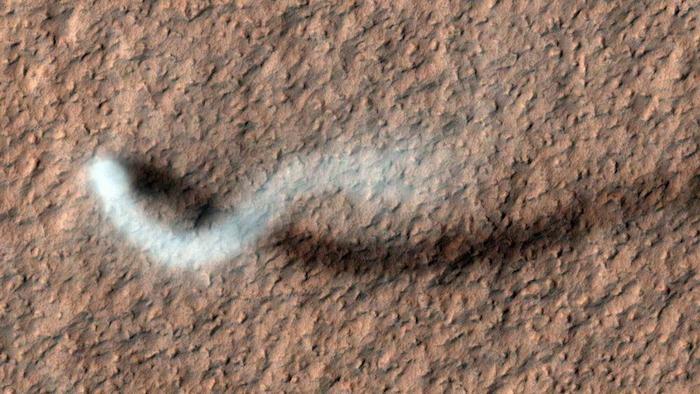 Dust devils lift dust into the Martian atmosphere, cooling the surface during the day and emitting long-wave radiation that warms the surface at night. "The Martian air is so thin, dust has a greater effect on energy transfers in the atmosphere and on the surface than it does in Earth's thick atmosphere," said Nair, an associate professor of atmospheric science. Meanwhile, scientists from the University of California, NASA and the Smithsonian Institution have studied a Martian rock found in the Antarctic 30 years ago that reveals a record of the planet's climate. Designated ALH84001, it is the oldest meteorite we have from Mars, a chunk of solidified magma from a volcano that erupted four billion years ago. Since then something liquid, probably water, seeped through pores in the rock and deposited globules of carbonates and other minerals. The team measured a pronounced ozone signal in the carbonates within the meteorite, suggesting that although Mars had water back then, vast oceans were unlikely. Instead, the early martian landscape probably held smaller seas. Carbonates can be deposited by living things that scavenge the minerals to build their skeletons, but that is not the case for the minerals measured by this team. By measuring the isotopes they found that Mars' atmosphere in this era, a period of great bombardment by asteroids, had much less carbon-13 than it does today. This may have occurred through extensive loss of Martian atmosphere. A thicker atmosphere would likely have been required for liquid water to flow on the planet's chilly surface. "We now have a much deeper and specific insight into the earliest oxygen-water system in the Solar System," said co-investigator Mark Thiemens, a professor of chemistry at UC San Diego. "The question that remains is when did planets, Earth and Mars, get water, and in the case of Mars, where did it go?"